A high proportion of new bike launches take place in Andalucía at the southern tip of Spain, within the triangle of Malaga, Ronda and Granada. There are a number of logistical reasons for this; Europe is the most convenient place for a world launch involving journalists travelling from as far afield as New Zealand and the West Coast of the USA. 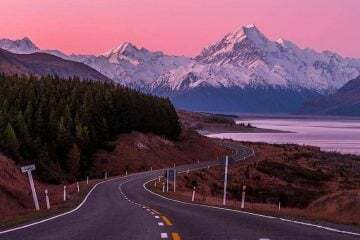 There’s also a developed infrastructure for flights and hotels, plus the roads are fantastic and once you get a few miles inland, there’s little in the way of traffic. With the new launch calendar busy between the months of November and March, it’s also a reliable location when it comes to the weather and quality of the light – at my age, balmy conditions and epic lighting for heroic photographs are a pre-requisite for getting out of bed. And, laying all cards on the table, the mood for a positive review can’t fail to be enhanced when riding spectacular roads in a warm, sunny location as opposed to, say, a gridlocked February afternoon in a grim, grey, cold and wet Scunthorpe. Mind you, as I sat shivering on my hotel balcony watching the never-ending conveyer of cumulonimbus storm cells create flash floods, raging torrents and horizontal precipitation, the thought of Scunthorpe on a winter’s afternoon was becoming more Hawaiian by the moment. With a cold front sitting smack-bang over Malaga, the southern tip of Spain was being battered and drenched by a cyclonic vortex producing continuous squall lines resulting in rain of tropical proportions, frequent thunder and lightning and unnervingly strong straight-line winds known as thundergusts. Ideal conditions for testing the all-new BMW F850GS and F750GS adventure bikes for the masochistic end of the market. The new BMW F850GS and F750GS are direct replacements for the previous long-standing and well-respected F800 and F700 models. As with the discontinued models, BMW has stuck with the tradition of encouraging the public to assume that they come with different sized engines while, in fact, they both share the same in-line 853cc twin (the old 800 and 700 models shared a 798cc in-line twin). Where these power plants differ is in their electronically programmed power outputs – the 750 kicks out 77hp and 83Nm of torque whilst the 850 has been programmed at 95hp and 92Nm. The original F800 was launched in 2007 and holds a sacred spot in the history of ABR magazine. Back in 2009, I was touring Europe with a couple of mates, one riding a KTM 990 and the other a BMW F800GS (I rode a Tiger 885 Steamer at the time), when the idea of ABR became less of a pipe dream and more of an ink on paper reality. Indeed, that F800 appeared on the front cover of the first issue of ABR. The BMW might not have been as capable off-road as the KTM, and the Triumph had it on power, but the 800 edged both when it came to a do-it-all, reliable and frugal member of the team. Over the years, there have been a few special editions and a refresh in 2013 to coincide with the addition of a GSA model, but essentially the F800 had survived for a decade in a highly competitive market, which says a lot about the competence and appeal of the old model. 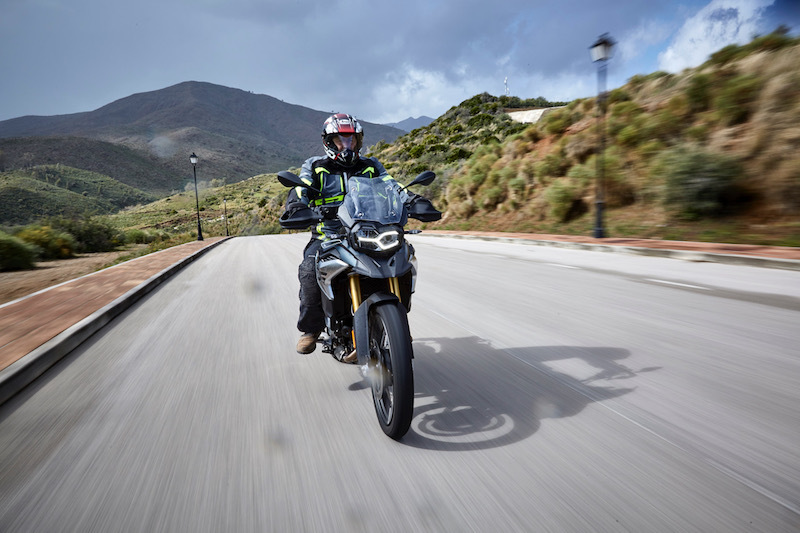 And speaking of highly competitive markets, the ‘mid’ range adventure sector is getting pretty hot these days with the launch of the new Triumph Tiger 800 and, assuming we’re not all on zimmer frames by the time it eventually emerges, the hotly anticipated Yamaha Ténéré 700. I’ve emphasised ‘mid’ in inverted commas, as when I was a lad anything over 400cc was thought of as big, whereas these days the ‘mid’ sector encompasses anything from the Honda CB500X, at £5,949, right up to the 1000cc Africa Twin with DCT, at £12,549, and includes machines such as the Suzuki V-Strom 650 and the Ducati 950 Multistrada. This is a subjective, personal view of the adventure motorcycle sector, but a debate I always win, of course. Generally speaking, the case made for buying a mid-sized bike, as opposed to a monster 1200cc, is that they are lighter and shorter, and therefore more manageable. They also offer a less traumatic experience when you next view your bank statement. However, with the current popularity of PCP deals the cost factor is not such a big incentive as it used to be, with the difference between monthly payments being easier to justify and hide from the wife. However, in my opinion, if you’re not that bothered with the prestige of owning the biggest and flashiest adventure bike, then some of the mid-sized machines on the market make perfect sense. They certainly have enough power, comfort, ability and features to keep most entertained. My only qualification would be, if a pillion is a regular feature in your touring plans then a larger capacity bike would probably be a better, more comfortable choice and make divorce – for unreasonable behaviour – less likely. My first impression of the new 850 is that BMW has spent a lot of time making it look like the 1200, rather than the 800 of old. Clamp on a plastic set of boxer twin side pots (there’s an open door for a profitable vanity accessories business here) and you’d be hard pushed to spot the difference at 10 paces. 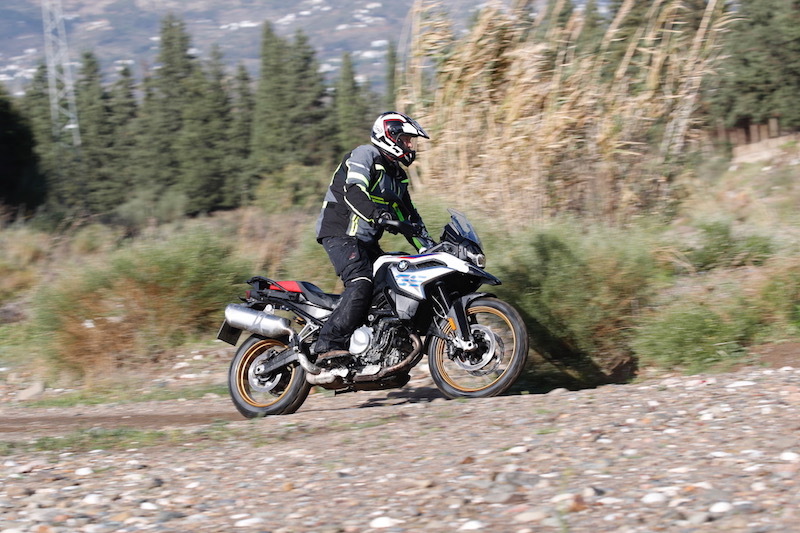 And there’s no doubting that the BMW F850GS is the bigger brother of the recently launched baby 310GS. All in all, BMW now has a family of GSs that look as if they are blood related, rather than just close friends in heavy makeup. Mind you, with it’s gold, spoked wheels and, especially in the red, white and blue colour scheme, there’s also a hint of Africa Twin in the air. So, what’s new with the 850? The short answer is everything, with the exception of a few screws here and there. This is a totally new machine built from the ground up with a new engine, chassis, frame, electronics, clutch, fuel system, gear box et al. In addition, the petrol tank, which was at the rear of the old 800, has been moved to the more conventional spot up front and between your legs, and both the chain and exhaust have swapped sides. Make no mistake, this is no update, the 850 is an all new motorcycle. 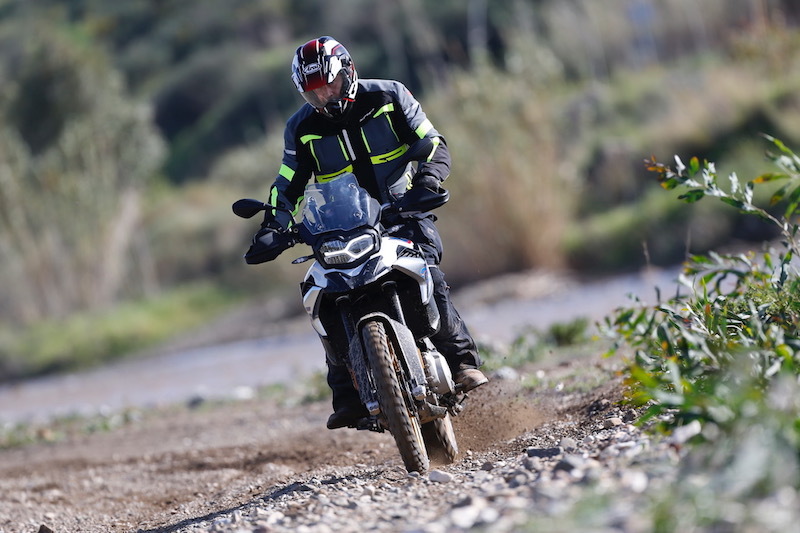 BMW reckons that the 850 is aimed at the ‘sporty traveller who likes dirt roads’, which was all very convenient as the raging Spanish weather had washed large quantities of mud onto the tarmac. And so we set off, or to be more descriptive, sailed. The holy trinity of seat, bar and peg alignment are adjustable or customisable and, at 6ft 2in, I felt the standard setting was ok with both feet planted on the floor and slow speed car park manoeuvres less of a sweat. The narrow waist of the bike will make it far less of a tip toe experience for those of smaller dimensions, but should you find it a stretch too far there’s a range of seat height options from 815mm to 890mm – but you’ll need to buy a different seat at the point of purchase as they are not adjustable. The stock screen is small, too small for my liking, and I’d imagine it would be for you too if you plan on doing extended miles and touring. As with the seat, the screen is not adjustable, and you’ll need to specify the size you’d like at the showroom. As much as BMW likes to say there’s a size to fit everyone, I’d much rather have just one adjustable screen I can change to suit rather than finding out I’ve made a frustrating mistake at the dealers. We were riding the £10,650 ‘Sports’ model, which comes pre-packed with five rider modes (Rain, Road, Dynamic, Enduro, Enduro Pro) and some serious electronic wizardry with the exception of the optional dynamic ESA, cruise and tyre pressure control, which were all fitted on our test bikes. The stock BMW F850GS is priced at £9,400 and comes with two rider modes (Rain and Road), ABS and traction control, but lean sensitive ABS, dynamic traction control, LED headlights, TFT dash, connectivity and additional rider modes are all optional extras. The first thing of note was the engaging roar of the engine. BMW has done away with trying to get a parallel twin to sound like a boxer engine (like they attempted with the older 800) and changed the firing order to a new 270/450 interval, offset 90-degree and replaced the twin opposed balancer shafts for a single horizontal component. If the previous paragraph sounds like I’m some sort of expert on internal tinkering, don’t be fooled for a minute. What I do know and have experienced is the result, and that’s a smoother ride, better fuel economy, increased power and a less hard-hitting symphony from the exhaust. Confession time: I preferred the more aggressive sound of the old 800. With the absence of a ‘flood’ setting I was forced to engage ‘Rain’ mode as we set off from base camp, and have to say I was quite surprised by how gentle the throttle delivery was. And that’s no bad thing as I tend to only engage ‘Rain’ when the conditions are bad enough to make any other engine mode a true test of fate. What’s interesting here is that the electronics on the 850 are all linked so that when you engage a mode, the ABS, traction control and dynamic ESA suspension all change their sensitivity to match. Despite the wet, slippery conditions and the level of gravel and dirt washed onto the roads, I was impressed with the performance of the safety intervention and the soft, comfortable ride quality. Unlike on some machines, there is a notable difference when changing modes and just as I was thinking that the new engine was gutless and the ride a touch willowy, switching to ‘Road’ or ‘Dynamic’ made a huge difference. The engine transformed into an engaging, smooth V-Twin with enjoyable power delivery and the suspension stiffened up to match. Spot on. I also liked the new gearbox configuration where the first three gears have been shortened for more optimal use around town and off-road, and the top three lengthened for better fuel consumption and more relaxed high-speed touring. The appalling weather conditions meant that we had to cut short our riding time. However, we did get a short break in the storm and were able to check out the high-speed handling of the 850 on a classic section of sweeping Spanish tarmac snaking through the nearby hills. I’d really like to spend more time on the bike, but in that brief period of respite from the atrocious weather I was able to establish that despite being fitted with a 21in front wheel and long suspension, the BMW F850GS has enough poke and precision to entertain the vast majority of perspective purchasers. BMW had planned an off-road extravaganza featuring a long trail ride and a visit to an enduro park, during which they hoped we’d all be mightily impressed with the performance of the 850. As it turned out, the off-road test had to be down graded significantly to a brief ride in the wet dirt, mud and sand alongside a wide river, which in normal times is a dried up and dusty creek. The new BMW F850GS is well-equipped on paper for some off-road fun; 21in spoked front wheel, a narrow waist to aid standing and gripping the tank with your legs, decent long travel suspension, Enduro and Enduro Pro riding modes, but it’s also still a heavy old lump for the novice at 229kg. In reality, and in the short time I had in the saddle, what looks good on paper transfers to performance in the dirt. I’ve pretty much come to terms with the fact that if you want any sort of on-road performance and long distance comfort from an adventure bike then there’s going to be a weight penalty to pay off-road. There’s no point moaning about it and wishing the impossible dream, that’s just the way it is. The best thing you can do is work on your ability and confidence, battle proof the bike as best as possible and go and have some fun. 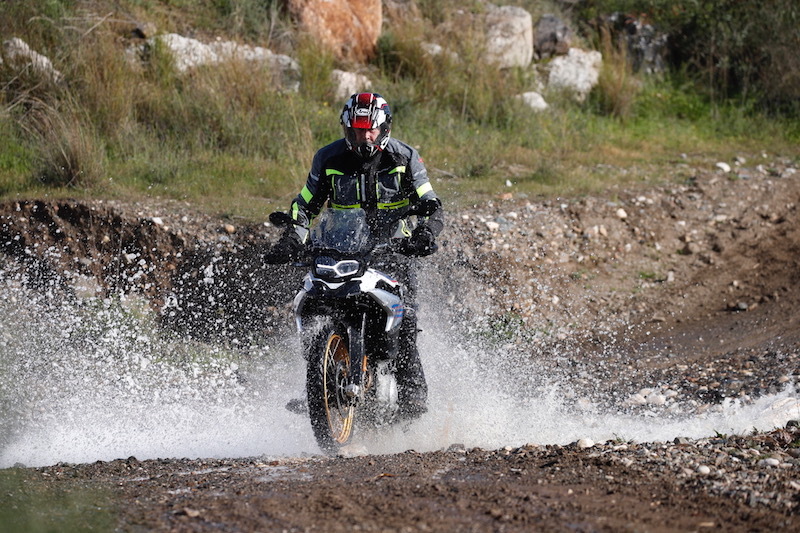 And trust me, these heavy adventure motorcycles are more than capable of taking on terrain and conditions you’d not think possible, but you’re going to need to up your game for anything more difficult than gravel roads and graded piste. This is one of the reasons most of the manufacturers have adventure bike off-road skills centres. At 6ft 2in, I find that I’d be more comfortable with bar raisers, and that would be the case with the 850. What I do like is the balance afforded by the narrow seat and tank, which allows for comfortable and controlled leg placement and movement when standing. The off-road riding modes are a great help, and the continuous development and fine tuning of the software is really starting to pay dividends and help make these machines more manageable and safe for both the novice and those of greater experience. The Enduro Pro mode on the 850 gives you full power, but disables the ABS to the rear whilst still retaining it at the front. Couple this with a traction setting that allows you to spin the back end out quite a way before kicking in and with just some basic training and confidence in the electronics you could be looking like a pro with rear end slides and skids. I’d like to spend more time on the BMW F850GS, that’s for sure. In the short time I’ve spent in the saddle I’ve been left with little doubt that it’s a step up from the old 800 and offers more in the way of off-road performance, plus enhanced refinement on the road. I’m not in favour of BMW dropping adjustable screens and seats and replacing them with a single fixed position item where you could end up having to buy two. I doubt if any perspective buyer will thank them for taking away the versatility of adjustability. 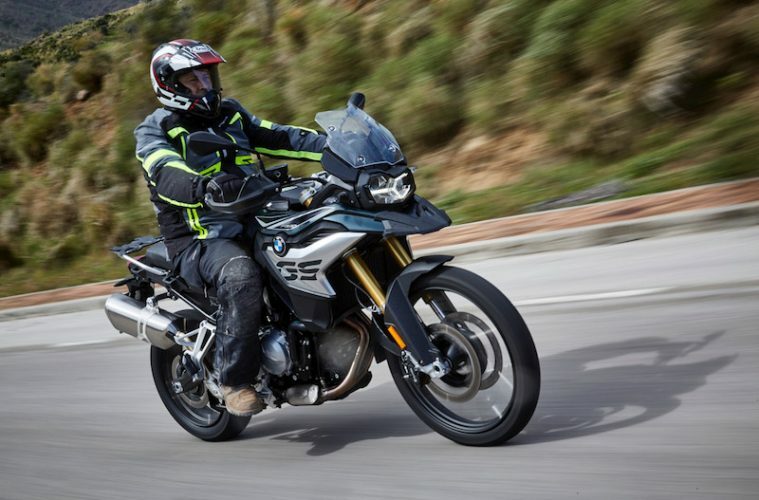 All in all, though, the new BMW F850GS is looking like it’s going to be a winner, and if a pillion did not figure in the buying equation it would certainly be on my shortlist for a test ride. Suspension front: 43mm inverted forks, non-adjustable. Brakes front: 2 x 305mm discs, two-piston sliding calipers. ABS (dynamic optional). Tyres front: 90/90 – 21. As a commuter: Nippy, frugal, a commanding stance and luggage options a plenty. 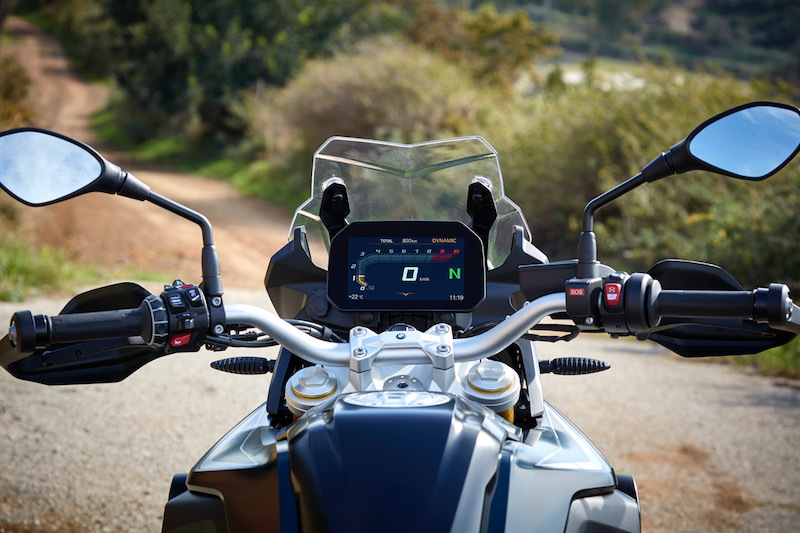 The BMW F850GS would make an excellent commuter, but I’d want a bigger screen for protection. As a weekend tourer: Just one look at this bike and I want to head off this Friday afternoon, and the Friday after, and the one after that… etc. Spot on. As an off-roader: Time spent off-road on the test was limited, but that experience has led me to believe this bike will be as capable, if not more, than any comparable machine on the market. As a continental road tourer: There are times when the extra power, speed and more relaxed ride of a larger capacity machine would be missed, but overall this bike will do the job with ease. As an rtw overlander: Has all the makings of a fantastic RTW companion that will help get you to places the larger, heavier machines might not. As a pillion carrier: I’ve not had the opportunity to carry a pillion and, of course, it will do so with ease. However, I’d be looking elsewhere if a pillion was to be a regular fixture.